Top-Meds.org is an online pharmacy which claims to be a reliable pharmaceutical source who guarantees the quality of the medication sold. They will also give you extra pills when you reorder from them. However, when we investigate this store we discover many concerning issues. These are issues you need to know about if you were interested in shopping here, read on to learn of this store’s problems. 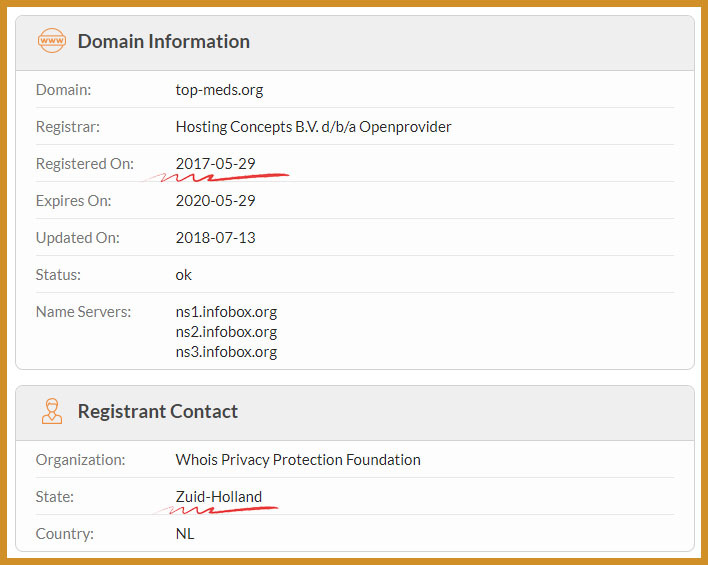 The domain information for this site reveals that it was registered in 2017 with more than one year to run until it needs to be renewed. This site address hasn’t been registered for very long and this can be an indication of a less reliable and perhaps even a scam online pharmacy. Sites which exist to rip people off, tend not to be around for very long, for obvious reasons. To add to the concerns we already have about this store is the fact that they have chosen to use a privacy service to hide their real contact information. Once again this can signify an unreliable pharmacy, because why would a legitimate business feel the need to hide their information in this way. 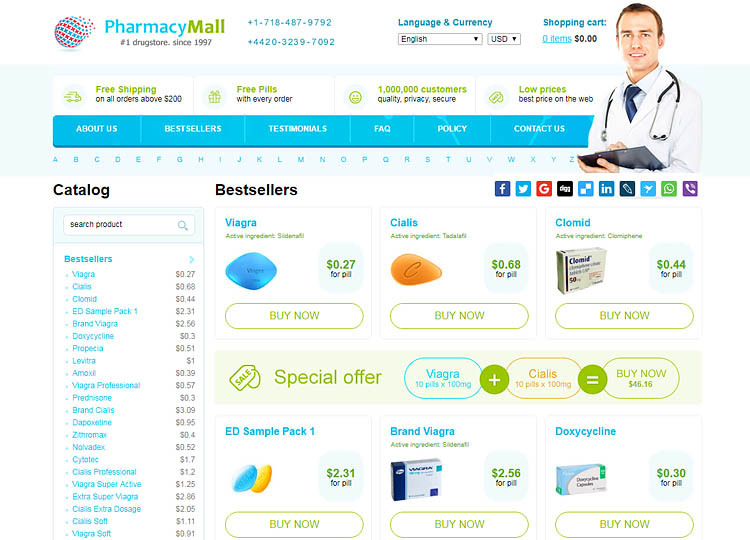 Reliable online pharmacies don’t have any issue giving you their contact information. 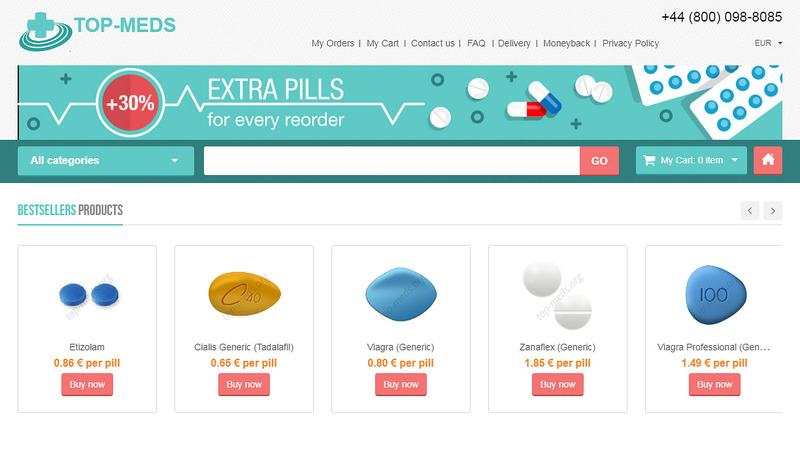 This online pharmacy doesn’t provide any contact details on their site. 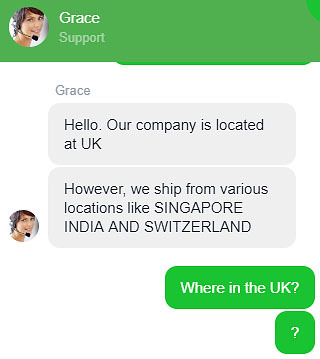 I asked their customer support on live chat “Where are you based?”, the answer was “Our company is located in the UK”. This answer was, not only grammatically incorrect but also lacking in detail, so I asked: “Where in the UK?”. They never responded. This lack of response would clearly suggest this is a question that is difficult to answer, most likely because they aren’t really based in the UK at all. They only say that because they have a UK phone number, but that doesn’t mean they are really in the UK. Services exist that will get you a phone number in many different parts of the world, that will then redirect to any other phone number. The owner of this store is claiming to be based in the UK and as such, they should be complying with the EU regulations on the selling of medication online. If they do not follow these regulations it means that they are operating illegally. The European rules demand that a common distance selling logo is featured on almost every page of the store. 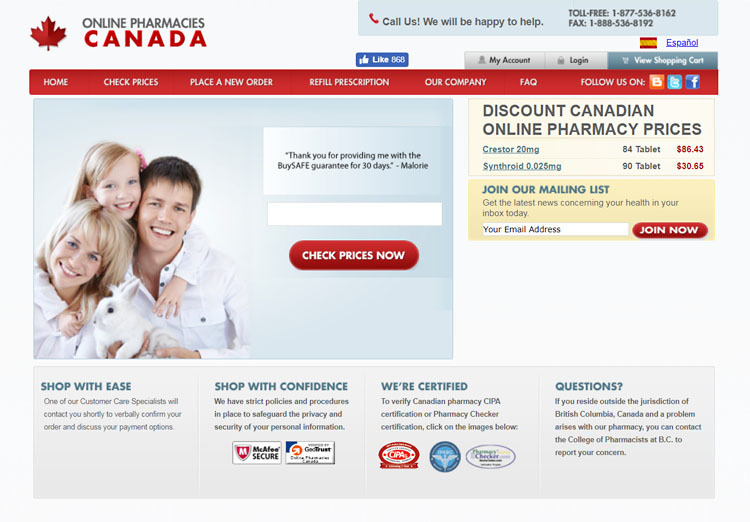 This logo is nowhere to be found on this online drugstore. Additionally, they are required to be registered with the appropriate government agency. In this case, the MHRA is the UK agency they should be registered with. On checking the Medicines and Healthcare products Regulatory Agency database we find that this pharmacy is not registered as they should be. 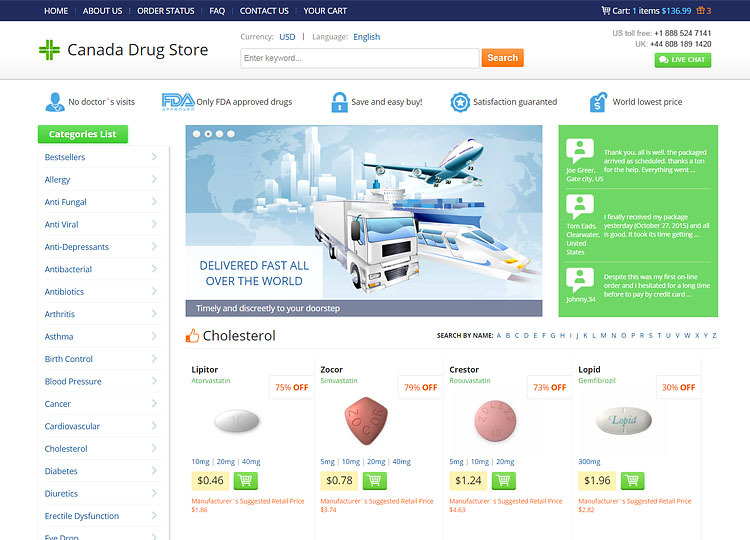 They are operating this online drugstore illegally if they are genuinely in the UK, which we doubt. A check with LegitScript confirms what we have already discovered. They conclude that this store is operating illegally in the countries they are selling medications. A fairly good range of drugs are available on this store. 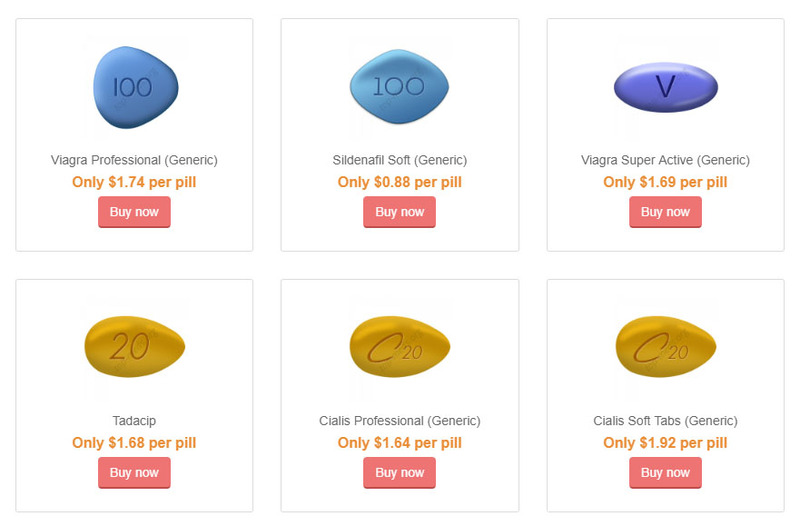 They seem to offer both generic as well as brand-name pills. 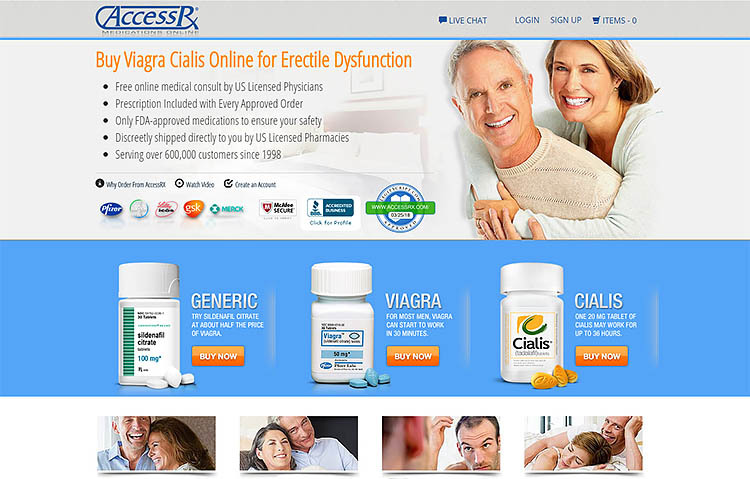 Despite the range of pills available the main focus of the site seems to be men’s health products, with a dedicated section on the home page of the pharmacy. As you may have seen before, drugs are apparently shipped from Singapore, India and Switzerland. When drugs are dispensed from multiple countries it does increase the risk of receiving counterfeit, fake and low-quality medication. And drugs made to low standards can be a very real risk to your health. The question of requiring a prescription is completely ignored by this store. They only go as far as saying you should consult a doctor before taking medication. 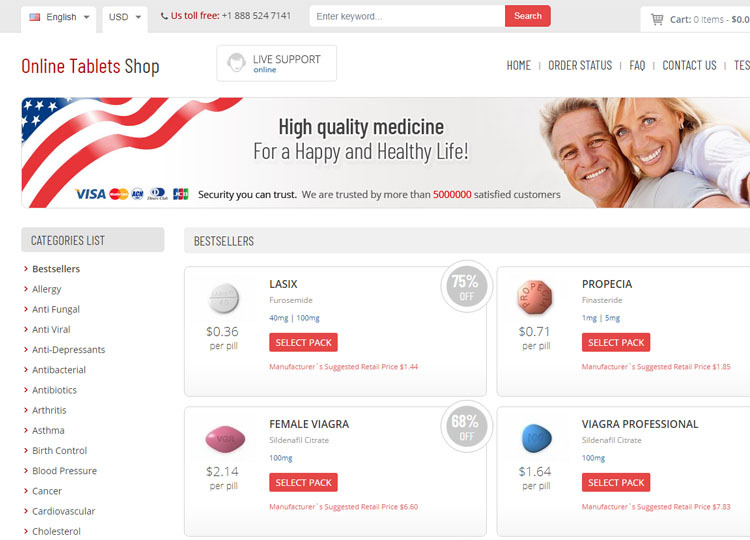 We’ve been unable to locate any discount coupons for this online drugstore. If you make the ill-advised choice of buying from this pharmacy you can only use Visa to pay. The store does have a valid security certificate, but when you go through the checkout you are diverted to a different site to put in your financial details. This other site is also using a valid security certificate and seems to be a common payment hub for this and the other affiliated mirror sites previously mentioned. It should be noted, you are subject to a minimum order value of $30 when buying products here. Your only shipping option is express delivery at the cost of $29.95. You do get a tracking number and delivery is expected in 7 to 10 business days. If you find yourself with any complaints about this pharmacy you can use an online form, UK phone number of live chat to solve the problem. The live chat, as previously shown, is all well and good until you ask a difficult question, then they ignore you. 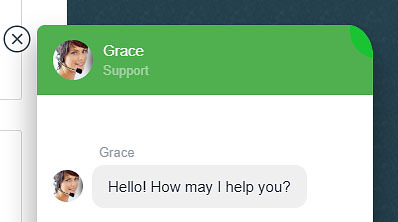 So if you have a problem with an order don’t expect much help from the support on live chat. We like to find feedback from previous customers to learn how well a pharmacy operates its business. When looking for Top-Meds.org reviews we haven’t been able to find any. This suggests that this drugstore doesn’t receive many customers, because popular stores always have a lot of customer testimonials on multiple review sites across the Internet. There is very little good about this pharmacy. They seem to be lying about where they are based, they have no regulation and the lack of customer feedback leaves us in the dark. In conclusion, we give this store just 0.9 out of 5 stars. Shopping for medication here is a big risk, a risk we really suggest you don’t take.